If you are new to digital photography, or have only been using your camera in all-automatic modes until now, these courses will teach you in a practical way about the basics of photography. It doesn’t matter whether you have a compact “point and shoot” camera, a prosumer, bridge, mirrorless compact system camera, or a digital slr, you will learn what its most important controls are, what they do, and how to set them properly. While most modern cameras can produce reasonably good results with average subjects when they are left in all-automatic modes, if you want to get more creative results, you need to take control over your camera. If you don’t understand what things such as shutter speeds, lens apertures, ISO and white balance are, moving away from the all-automatic settings can be daunting – and camera manuals are often little help – but these courses will explain in plain english how to take control of your camera and show you how to lift your photos from average to great. You will learn how to set and assess exposure correctly, where to set the point of focus, and how to get the best quality images that your camera is capable of delivering. 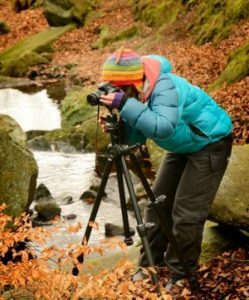 See here for details of exactly what is covered on each part of our photography courses for beginners. 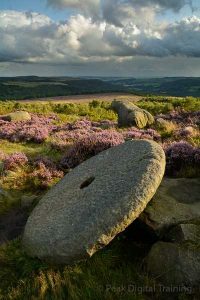 There will be a wide range of subjects available for you on all the courses, including (depending on the weather) stunning views of gritstone edges, abandoned millstones, an Iron Age hill fort, and waterfalls in one of the finest little valleys in the whole of the Peak District. To make sure that you get plenty of individual attention and can have your questions answered, numbers will be limited to a maximum of six people on each of these courses. The day will involve some short walks over rough moorland and sometimes quite steep ground, so while it will not be strenuous, it is not suitable for people who have mobility problems. Stout footwear with good grip is strongly advised, as is appropriate outdoor clothing for the time of year. Each course lasts a full day, with time for lunch in a nearby pub or tearoom – or you can bring a packed lunch if you prefer. We will be providing a laptop computer so you can check and assess your photos during the day. The cost for the day will be £85.00 per person (excluding lunch). Please contact us to request a booking form, or if you need any further information. 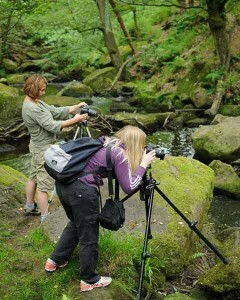 You can also see here for details of all our other digital photography courses near Sheffield and in the Peak District.